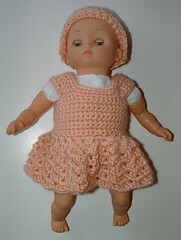 This baby doll dress was crocheted to fit the cloth body dolls that are about 14 inches long and have the wider bodies. The doll has a 11 to 11-1/2 inch chest. 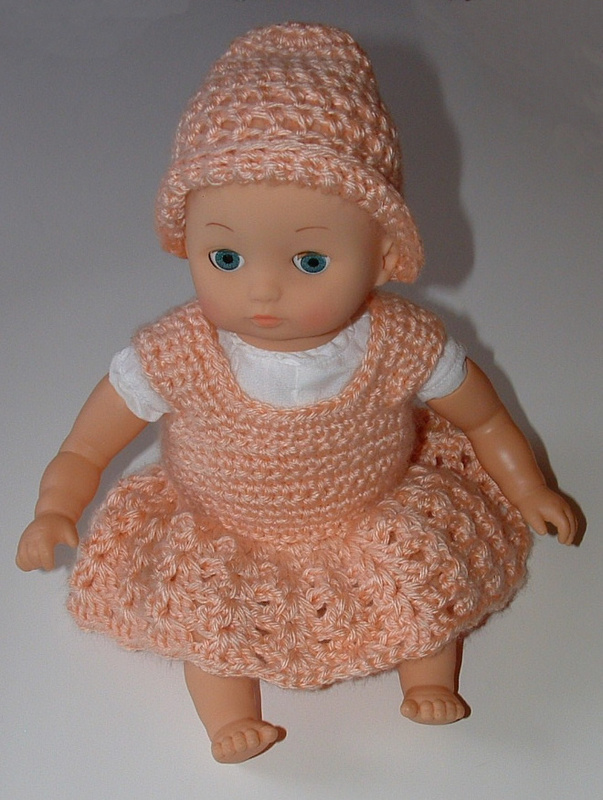 I crocheted using Caron Lt Peach Country yarn for the baby doll dress and hat. 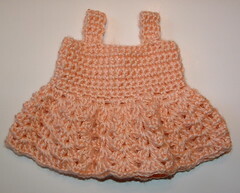 Both items used less than 3 ounces of yarn to complete. Doll’s head is 10-3/4 inches around. The hat I crocheted is about 11 inches around and 4-1/4 inches long. Shoulder straps measure 3-1/3 inches long, dress from shoulder to hem is 7-1/2 inches long and 12 inches around chest with back closed with Velcro closure. Sc in 1st st *Ch 1, Sk 1 st, Sc in next st*. Repeat between * and Sc in the last st of row and join to beg Sc. Work in rounds from this point on without turning. Ch 3, Dc, Ch 1, 2 Dc in sm sp between shell (3-Hdc’s of prior row). Then 2 Dc, Ch 1, 2 Dc in each sp between shells around. End with Sl St to beg Ch-3. Sl St to Ch-1 sp, Ch 3, Dc, Ch 1, 2 Dc in Ch-1 space. Continue working Dc shells (2 Dc, Ch 1, 2 Dc), in each Ch-1 sp around. Join to top of beg Ch-3 at end of round. Leaving yarn attached at lower hem back edge, Sc in ea st and space around bottom edge of top. Join with Sl St to 1st Sc. FO. Sc in ea st across. Ch 1, turn. Repeat until strap measures 3 inches long in length which was 12 rows using Caron yarn. Leave 3 inch long tail to attach strap to front. Skip over 6 sts for armhole and attach yarn at front. Use the tail to whip st across 3 sts to secure strap at front. Repeat strap for the other side making sure the straps match each other on placement. Photos below taken before the edging was added. Edging: Attach yarn at back left bottom opening, Sc evenly up the left side edge and around the inside of shoulder straps, around neck and back down to the bottom of the other side’s opening edge. Sl St to beg Sc. FO. Attach yarn at inside lower edge on the armhole opening, Sc around evenly around the armhole. Join with Sl St to beg Sc. Finish off. Repeat for the other armhole. Sew Velcro strips at back as shown for closure. Fits Baby Doll 10″ to 10-3/4″ Head Cir. Finished hat is 4-1/4″ long by 11″ around using 3/4-oz Caron Aran yarn. Check fit of the hat on your doll and adjust as needed. Ch 1, Sc in ea st around. Join to beg Sc and FO. If you have any questions or find discrepancies in this pattern, please email me using contact tab. I love this dress. 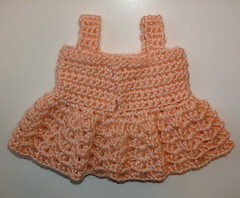 My grand daughter and great nieces and nephew all love homemade doll clothes. Sizes for anything smaller than or bigger than the American Girl 18 Inch is next to impossible to find. Thank you so much for sharing. Thank you for your pattern. I played with it a bit and got it to fit the 15 Inch Mary Maxim dolls for a doll I’ll be donating at Christmas. Thanks for providing this pattern. 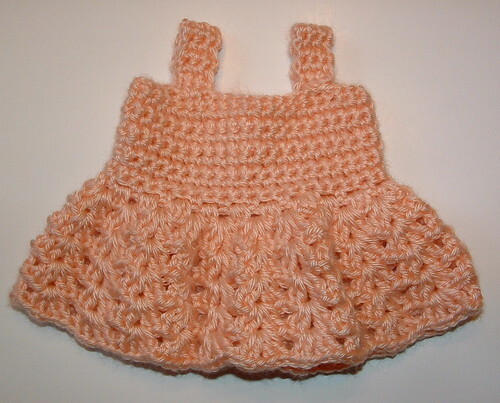 @Bailey – So glad you liked the pattern and were able to adapt it for your 15 inch doll. Best wishes and come back to visit again.